So I really tried to get away from yet another post about a Kishore Kumar song but alas, it was not meant to be. It was a sign from above, literally, as we were watching Sony TV via satellite over the holidays. First we saw the Filmfare Awards from last year with SRK performing host duties all complete with the obligatory shot of Big B followed by a shot of Rekha immediately after. In between there was trivia aplenty about the Filmfare Awards themselves (the Bollywood equivalent of the Oscars). 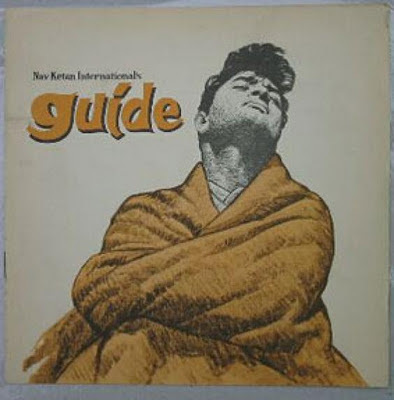 One of those tidbits was regarding the movie 'Guide' starring Dev Anand & Waheeda Rehman which swept the awards of Best Movie, Best Director, Best Actor, Best Actress & Best Screenplay. Immediately after the awards show we watched a new singing competition whose premiere was the biggest debut on Sony TV for an original series. It is called 'K for Kishore' and pits 20 contestants culled from throughout India in an effort to find that one singer that not only sounds like Kishore but emulates his spirit as well. The judges include Amit Kumar (Kishore's 1st son), Bappi Lahiri & the singer Sudesh Bhonsle. It was then that I realized that I was not alone in missing Kishoreda - that everyone from the 20 year old contestant who was born after Kishore's death to the 60 year old grandfather who learned to sing every Kishoreda song ever recorded and has his picture in his mandir - missed him as well and that he is still relevant now despite all the years since his passing. The song for today is 'Gaate Rahe' (a duet by Kishore & Lata) whose sweet melody, amazing picturisation, poetic lyrics and the strength of Kishore' voice as he holds those first few notes seemingly forever makes this one of my all time favorites and the perfect song to open the new year. Happy 2008 and thanks to everyone for all of your support and good wishes! I tried to watch Guide a few weeks ago and due to technical difficulties was not able to finish. I was heartbroken - the part that I was was absorbing and fascinating and brilliant. :( It is an amazing movie on DVD but an absolute event on the big screen. In India the theaters will play old classics such as this for morning matinees and I had the great privilege to see it on the big screen there. Hopefully your next attempt will be more successful! Also, check out that you're on our blogroll too under "filmi music" on account of the juke box. Glad you enjoyed the movie & appreciate the link - I did the same for you. I think this may have been the only movie in which Dev Anand sported a beard for the role and it suited him quite nicely!